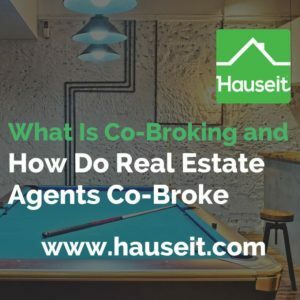 What Is Co-Broking and How Do Real Estate Agents Co-Broke? What does co-broke mean? 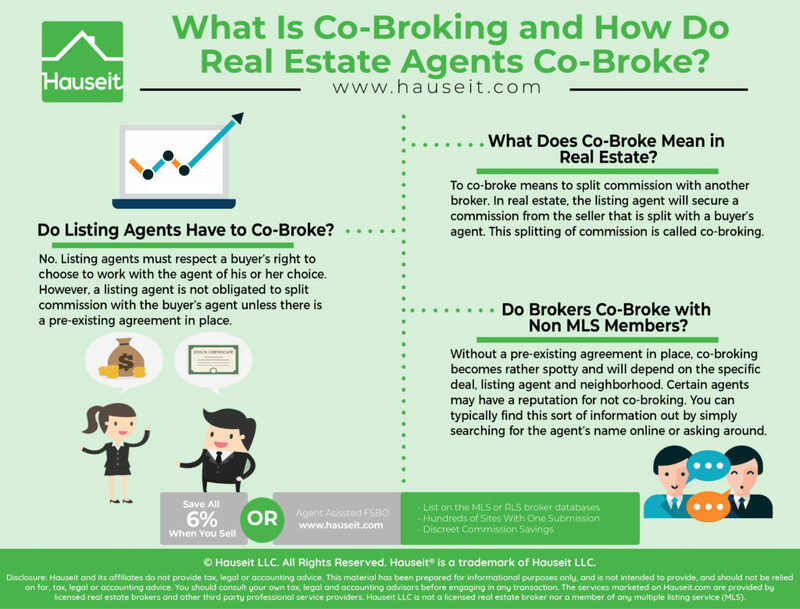 What is this concept of co-broking that real estate agents keep referring to? We’ll explain everything you need to know about co-broking in this article and even show you a sample co-brokerage agreement. What Does Co-Broke Mean in Real Estate? Do Listing Agents Have to Co-Broke? Do Brokers Co-Broke with Non MLS Members? To co-broke means to split commission with another broker. In real estate, the listing agent will secure a commission from the seller that is split with a buyer’s agent. This splitting of commission is called co-broking. If the buyer does not have a separate agent, then the listing agent will represent both parties under dual agency and collect the entire commission. Pro Tip: In New York, real estate attorneys are required for both the seller and the buyer. Make sure you read our guide on questions to ask your real estate attorney before you hire them so you pick someone who specializes in real estate. Otherwise, a generalist lawyer may not understand that you shouldn’t mark up the main purchase contract, but rather that you should use a contract rider! No. Listing agents must respect a buyer’s right to choose to work with the agent of his or her choice. However, a listing agent is not obligated to split commission with the buyer’s agent unless there is a pre-existing agreement in place. Fortunately for buyers’ agents, members of the same MLS will automatically have a co-brokerage agreement in place which applies to all members. Terms will vary depending on the MLS, but many MLS systems will require the listing agent to co-broke at least 50% of the total commission. In NYC, co-broking is governed by the REBNY RLS and the RLS Universal Co-Brokerage Agreement Rules and Regulations that all member firms must agree to upon initiation. However, just because members of a MLS have a pre-existing agreement in place does not mean that all listing agents will play ball. In fact, many listing agents will be purposefully slow to respond to inquiries from discount brokers. Think about it. It already stings to have to split commission, so why put salt in the wound by helping someone who’s out to disrupt your livelihood? Discounting is not exactly a novel concept, and most discount brokers spend their time talking trash about the industry and how to plan to “disrupt it.” What if the only thing they disrupt is your deal? 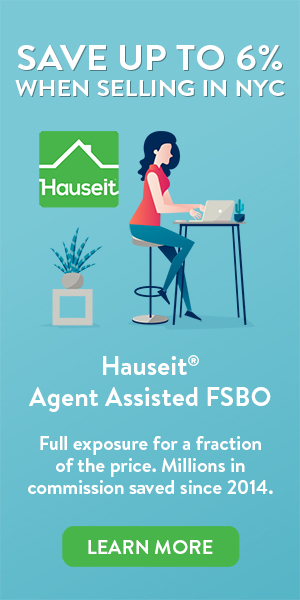 Fortunately, home buyers in New York can receive a Hauseit Buyer Closing Credit without disrupting their deal by working with one of our established, traditional partner brokers. All of our partner brokers are reputable, highly experienced real estate brokers who never openly discount their services. As a result, they have great working relationships with the rest of the brokerage community so you’ll never have to worry about other agents treating them or you any differently. Pro Tip: Are you a first time home buyer? If so, you should take advantage of the various first time buyers programs available for New Yorkers. After you’ve signed up with one of our experienced partner buyer’s brokers who have already agreed to discreetly provide you with a buyer closing credit, ask us for a referral to one of our trusted real estate attorneys. Read our article on average real estate attorney fees in NYC. You’ll be shocked to find out how affordable real estate lawyers can be! Without a pre-existing agreement in place, co-broking becomes rather spotty and will depend on the specific deal, listing agent and neighborhood. For example, local real estate agents in parts of eastern Queens who aren’t members of REBNY will be very difficult about co-broking. Some agents of small, local brokerages in Queens may flat out refuse to co-broke. The same goes for much of Staten Island which has its own MLS. Parts of southern Brooklyn are notorious as well for the lack of co-broking. If you are a seller in one of these areas, please be careful! You could easily end up paying 6% in commission to an agent who has no intention of working with buyers’ agents. This is extremely harmful to your sale prospects as 90% of all home buyers are represented by agents. If you’re selling a home in Queens and faced with this conundrum, we recommend signing up for a Queens flat fee MLS listing so you can save all 6% in commission instead! 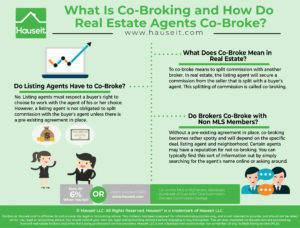 Certain agents may have a reputation for not co-broking. You can typically find this sort of information out by simply searching for the agent’s name online or asking around. Furthermore, a listing agent may already have an accepted offer on a deal and may not be inclined to continue showing. This can easily be misconstrued as a refusal to co-broke when in fact the listing isn’t really available anymore. On the other hand, in a slow market a listing agent may proactively reach out to other agents offering to co-broke if they bring a buyer. Pro Tip: Do you know what closing costs in NYC are? If not, estimate your seller closing costs with our handy Closing Cost Estimate for Sellers in NYC. Buying a home for the first time? Get an idea of what you’ll owe in closing costs with our interactive Closing Cost Calculator for Buyers in NYC. This is a great example of a co broker agreement between a listing agent and a buyer’s agent who are not members of the same MLS. You have indicated that you wish to act as a cooperating broker in connection with the possible sale by Patrick Walker (“Seller”) of the Property. This letter will confirm the terms under which you may so act. You represent that you are a real estate broker duly licensed in the State of New York, that your associate brokers and salespersons are real estate brokers or salespersons duly licensed in the State of New York, and that to the extent now or hereafter required by applicable law or regulations, you have filed or will file all forms or statements required by law. You and your associate brokers and your salespersons shall maintain such licenses in good standing throughout the term of this Agreement. In connection with the prospective sale of the Property to a purchaser procured by you, you agree to accept a brokerage commission in an amount of no less than [three] percent % of the Net Purchase Price (as defined below) for the Property in connection with such sale. Such brokerage commission shall be deemed earned by you and deemed due and payable by Manhattan Top Real Estate LLC (“[Co-brokerage]”) only when (i) a binding purchase agreement is executed by a purchaser and executed by Seller and (ii) such purchase agreement is consummated and the agreed-upon purchase price (as such amount may be adjusted between contract and closing) is paid. Such brokerage commission shall be payable at closing. If title to the Property does not close for any reason, except Seller’s willful default on a purchase agreement, no brokerage commission shall be deemed earned by you. Manhattan Top will make its best effort to ensure that Seller delivers a check to you in fulfillment of its obligation to pay a co-brokerage commission. In the event Seller does not deliver such check, Manhattan Top shall make prompt payment to you in order to fulfill the obligation arising under this paragraph. The “Net Purchase Price” of the Property shall mean the actual purchase price paid by the purchaser pursuant to the purchase agreement for the Property, or the actual purchase price stated in such purchase agreement in the event the Property is not sold but a commission still becomes due. In the event that: (i) you procure a purchaser for the Property, (ii) a purchase agreement is fully executed by such Purchaser and the Seller, (iii) the purchaser defaults, and (iv) the Seller retains all or a portion of the down payment given by the purchaser, and (v) the Seller pays Manhattan Top Real Estate LLC a percentage of the down payment retained by the Seller, then Manhattan Top Real Estate LLC shall pay you [50%] of the amount paid by Seller to Manhattan Top Real Estate LLC. It is understood that you are an independent contractor and shall not be considered Seller’s agent or the agent of Manhattan Top Real Estate LLC for any purpose whatsoever, and you are not granted any right or authority to assume or create any obligation or liability or make any representation, warranty or agreement (express or implied) on behalf of Seller or Manhattan Top Real Estate LLC, or to bind Seller or Manhattan Top Real Estate LLC in any manner whatsoever. You agree that you or your associate broker or salesperson will contact Manhattan Top Real Estate LLC in advance to arrange for any appointment to view the Property and that you or your associate broker or salesperson will accompany your prospective purchaser on all visits to the Property. Any and all communications between you and Seller regarding the Property must be made through Manhattan Top Real Estate LLC. No waiver of or consent to any breach of any condition, covenant or agreement contained in this agreement shall be construed to be a waiver of any subsequent breach thereof or of this agreement, nor shall the illegality or the invalidity of any provision of this agreement affect the validity of the remaining provisions. This agreement shall be binding upon and inure to the benefit of, and be enforceable by, the parties hereto and their respective successors and assigns, except as set forth in the following sentence. Neither this agreement nor any payments due you hereunder may be assigned by you, and any such attempted assignment shall be void and of no force or effect. This agreement shall be governed by and construed in accordance with the internal laws of the State of New York applicable to agreements made and to be performed wholly in the State of New York, without regard to principles of conflict of laws. The parties hereto acknowledge and agree that disputes arising out of this agreement will be subject to the jurisdiction of the courts of New York and hereby waive any right to protest or otherwise remove such jurisdiction. This agreement constitutes the entire agreement between the parties with respect to the subject matter hereof, and any other agreements, whether oral or written, heretofore entered into between Seller and you with respect to Manhattan Top Real Estate LLC’s brokered sale of the Property are hereby cancelled and of no further force and effect. Both parties hereto shall comply with the resolutions of the Residential Brokerage Division of the Real Estate Board of New York, Inc. with respect to co-brokerage. If you agree to the terms of this agreement, please sign below where indicated and return a copy to me at your earliest convenience.